14-Oct-2018 -- Driving from southern California to southern Arizona (Tucson and Phoenix) for a mountain biking vacation, I (of course) wanted to visit some Degree Confluence Points - but I had already visited all of the points near my route. But I was interested in revisiting some of the points that I’d already visited, to get a new, drone’s-eye view of the point. 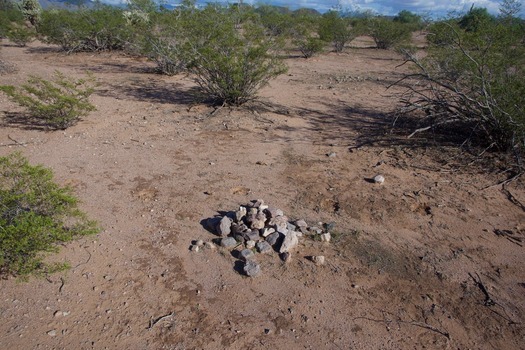 The first of these was this point - less than a mile west of the lonely Ajo-Tucson road (which seems to be used mostly by employees of the U.S. Border Patrol). During my previous visit - 11 years ago - I approached the point by walking along a small drainage (which runs roughly east-to-west, towards the point). This time I took an even easier route - along a dirt road that runs just south of the drainage (and passing about 0.1 mile south of the point). Unfortunately this road was gated closed, so I couldn’t drive along it. But it was an easy walk - about 1 mile each way. The point lies in flat, sandy terrain that stretches for miles in every direction. It’s clear that sometime in the past this area was a lake. In the Tohono O'odham Indian Reservation.